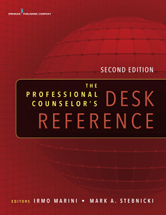 The second edition offers a unique interdisciplinary approach inclusive across all counseling disciplines and features contributions from over 110 highly regarded experts in counselor education, research, and practice. 11. Professional Disclosure in Counseling - Lloyd R. Goodwin, Jr.
71. Substance Abuse Assessment - Lloyd R. Goodwin, Jr.
72. Treatment for Substance Use Disorders - Lloyd R. Goodwin, Jr.